The upside down umbrella. It's probably the most used symbol in the rainwater harvesting industry. For most people it represents a change in the way we think about rain- from nuisance to cherished natural resource. 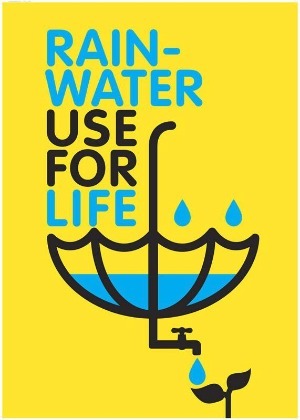 It is also highly inspirational and a great tool for rainwater harvesting education. For example, the poster shown here is the first prize winner in the Rain Drops Geneva poster competition, sponsored by IRHA. But for our company and a few others around the world, the upside down umbrella is more than just symbolic. As you can see from our Pinterest page, there are many designers out there working on free standing rainwater collection, in addition to our products. We are clearly not alone in believing it's just a matter of time before non-roof based rainwater harvesting becomes commonplace.